If it is artisanal, innovative, and a bit edgy, Miriam Hookings is ‘all over it’. 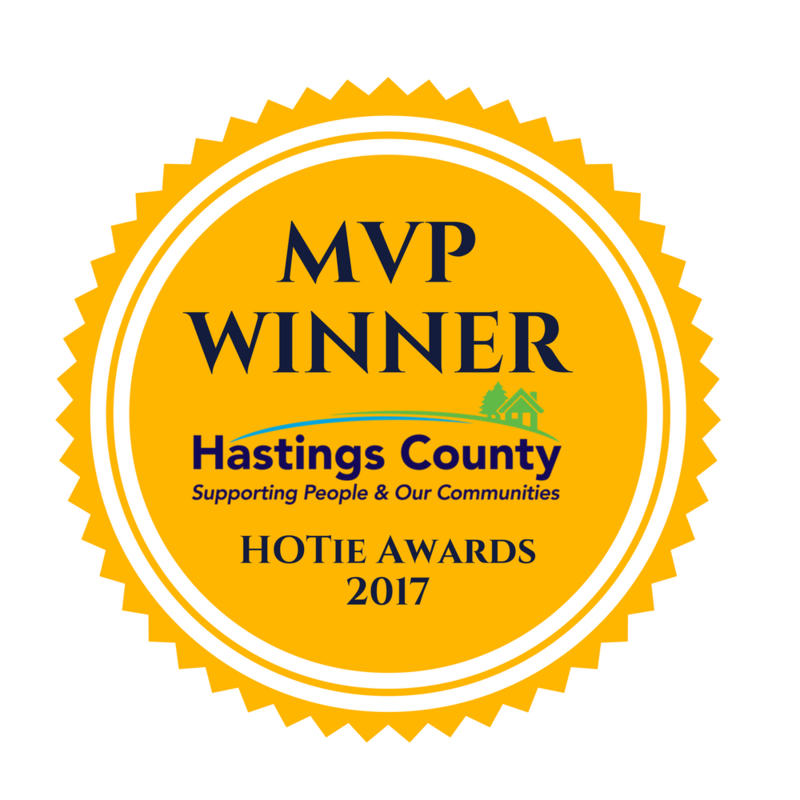 Like her artistic endeavours, Hookings stands out in the rural crowd, with a creativity that mirrors the pulse of Hastings Highlands, where she resides with her husband Mike and three children Ruby, Ezra and Jasper. In the summer you can find her engaging live theatre patrons in Bancroft. She also enlivens the stage at the Arlington Hotel, where she moonlights as the lead vocalist with indie-band Natural Radio. Miriam can get a crowd dancing, or “flash mobbing” if need be, which she has accomplished, at Bancroft’s Millennium Park, with finesse. It is her seam serging however, that is getting everyone talking. Under the brand name Lucky Maloo, Miriam single-handedly repurposes fabric textiles as part of her independent, upcycled fashion line. She describes her clothing as “one of a kind upcycled,” which she abbreviates to “OOAK” - an acronym that looks simple, until you try to pronounce it. Upcycling is a sustainable fashion trend that is becoming increasingly popular amongst eco-friendly fashionistas, who want to tread lightly upon the planet, while remaining stylish. It is also an economical choice for Miriam’s small business that keeps her overhead production costs low. Her decision to use repurposed clothing however, is a largely philosophical and conscious one. While much of the clothing industry discards end up in secondhand stores, in Ontario a significant portion finds a home in landfills. Textiles, predominantly clothing, account for approximately 2 million tonnes of landfill waste, every year. And it is also about the hunt. Miriam is an intrepid shopper with an eye for making every product better than it was before she obtained it. She is also proud that these purchases contribute to the direct support of organizations such as the North Hastings Hospital Auxiliary and the Hospital Wish Foundation. As a sustainably-minded designer Miriam hopes that consumers will get into the habit of thinking twice before they discard used clothing and make conscientious efforts towards donating it. From the textures, to the search for fabrics, to the serging and stitching, Lucky Maloo’s clothing is all uniquely one of a kind. But all of Lucky Maloo’s clothing shares a common technique and that is the unique “seam serge” that shows where each stitch has penetrated the fabric. Lucky Maloo’s dresses flaunt this exposed seam, and where many clothing designers go to great lengths to bind and tuck seams behind layers of fabric, Miriam does not do this. In fact, she does the exact opposite, by highlighting it. Whether it is a sundress, a vest, or multi-colored tights each Lucky Maloo piece draws attention to contrasting fabrics and shows how they have been bound together through differences in colour and texture. The seam itself serves as a reminder of the fabric’s history - its other life - as a different piece of clothing, for a different owner. Customers sometimes bring their own textiles to Miriam with a new design in mind - fabrics are often family heirlooms, like a wedding dress, or baby clothing. Lucky Maloo designs quilts, often commission pieces, that often involve repurposing a clients clothing to create a family heirloom. In addition to clothing, Lucky Maloo also designs quilts, often commission pieces, which involve repurposing a client’s clothing - which might include anything from sports jerseys or a child’s school career in uniforms. These types of quilts have become popular, individualized wedding presents, and have also been commissioned to commemorate important milestones in her clients’ lives, such as the birth of a child. And it is a meaningful way to repurpose those bulky maternity clothes, especially when they are transformed into a blanket, to wrap around that precious baby. Stitch in some of Grandma’s clothing and you have a family heirloom. Warmth is a prominent theme in Lucky Maloo designs. It is expressed in the use of cashmeres, wools and cotton fabrics, as well as in the company’s design choices. These include scarves, neck warmers, arm warmers, and leg warmers and long-sleeved baby-doll dresses with thumb-holes and hoodies. These outfits appeal to the hip and youthful in spirit. And they are also practical, speaking of the needs of women in rural communities, where most homes are heated with wood, a fuel that doesn’t always allow for a consistent temperature to be maintained. Lucky Maloo’s “bum warmers” are the company’s biggest seller. These wool mini-skirts are a popular and colourful accessory to wear over little black-tights, a wardrobe go-to-piece in North America. Lucky Maloo’s playful and carefree clothing can be found at the Maynooth Farmers’ Market and as part of the Bancroft and Hastings Highlands Studio Tour. There is also a virtual gallery on Facebook. Lucky Maloo is helping fashionistas make unique personal statements. It is also providing an eco-friendly option that appeals to consumers who do not want the ‘cookie cut-out” cloaks that are marketed as fresh each season, but which rarely change in their style or presumptions about how people want to look. Most importantly, these designs are artisanal, allowing wearers a chance to present themselves, as the unique works-of-art that they truly are.